The Heritage Museum allows residents and visitors to celebrate the natural and cultural history of the 1000 Islands region. Over 30,000 visitors annually enjoy this popular waterfront attraction. The site on which the Heritage Museum now stands was originally the main station for the Thousand Islands Railway. After passenger service ended in 1962, the station, owned by the Town of Gananoque, became a restaurant but was destroyed by fire in 1990. 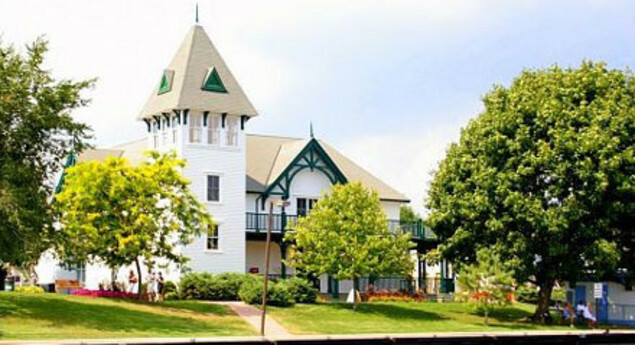 The Town of Gananoque continues to own the building but the museum is operated and governed as a registered non-profit charitable organization dedicated to creating exhibits and archives, collecting and preserving artifacts that interpret the unique history, life and times of the Thousand Islands Region and its communities. Much like Arthur Child, who grew up in Gananoque and wanted to ensure the preservation of the rich history of the Thousand Islands region. Admission is free. Self Guided or Guided tours available. The building is wheelchair accessible to all areas excluding the tower. Photo Credit: Photography © 2017 The Corporation of the Town of Gananoque, used under the Creative Commons Attribution-ShareAlike License. Text Credit: Site description from Arthur Child Heritage Museum, used under a Creative Commons Attribution-ShareAlike License. Photo: Photography © 2017 The Corporation of the Town of Gananoque, used under the Creative Commons Attribution-ShareAlike License.